RJ45 8-pin modular to D-sub adapters are widely available for about $2 and are convenient for RS-232 connections. If you have a number of serial devices with different pin-outs, you can make adapters so that any device can easily be connected to another device. These universal adapters are particularly handy for devices such as hubs or controllers that only occasionally need to be connected to a terminal. All devices are wired the same at the modular jack and the flat modular cable flips the connections. This way, any device may be connected to any other device, regardless of whether it is DTE or DCE. The modular plugs are installed on the cable so that the connection is "flipped." When the plugs on the two ends of the cable are held next to each other, the order of the colors is reversed. 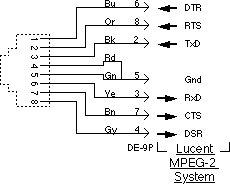 Where two wires are connected together in these wiring diagrams, solder or crimp the connection. 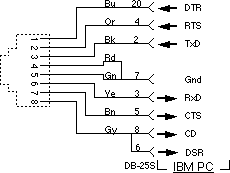 More details on making RS-232 connections to Macs. Do not use this pin-out for connecting a modem to the AUX or console port on a Cisco router. Use this pin-out. 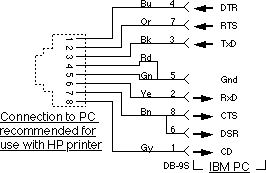 At the computer end of the serial cable, HP recommends that the DSR and CTS inputs of the computer should be driven from the printer's DTR output. This is an example of a device which is pinned for connection to the 9-pin port on a PC with a pin-for-pin cable. Tomi Engdahl compiled a page detailing various "standards" for the pin-out of the modular connector. One such standard is the Yost Serial Device Wiring Standard, which is similar in concept, but not pin-for-pin compatible, to what I have detailed here. 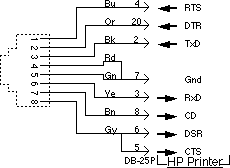 The Comtrol Rocketport serial card uses the RJ-45 with another pinout which is described by Jim Price. Please send your comments and suggestions.